February may well be the shortest month, but we’ve certainly come a long way! This month we added a new app to our offerings – say hello to the CoinPayments Payment Gateway! 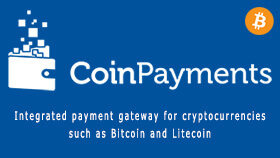 The CoinPayments Payment Gateway app offers an integration with CoinPayments allowing store owners to accept crypto-currency payments (like Bitcoin, Litecoin, Verge, and hundreds more) for their products. CoinPayments allow you to select which crypto-currencies you’d like to accept, and you can also choose to have them automatically converted to a base crypto-currency, or even fiat currency like USD. The new CoinPayments Payment Gateway app is available for all sites, and you’ll find it in your admin panel apps page, along with documentation to get started. The month started with several issues popping up after last month’s huge updates, and it felt like the end of the world. After screaming for several hours I finally came to my senses and got on with trying to find the cause of the issues. As a result a new debug tool has been built into the platform core accessible by adding ?debug=true to the end of any URL from the platform, which will render the page without caching enabled and with any error messages displayed. This new tool allowed me to narrow down the exact causes and promptly fix the issues. Hurrah! Thanks to the new debug tool the login widget has been the victim of more bugfixes after last month’s rewrite (the cause of all my earlier screaming). The admin dashboard “At a Glance” & “My Account” metaboxes, and the admin bar have also had various small bugs squashed. Another issue popped up after last month’s big updates where attempting to go to your domain mapped site via the original thatwebsiteguy.net/sitename url resulted in taking you to your site, but with a 404 page – this issue has now been fixed. The platform’s email system has received an important security patch, and there’s also now support for the Mailgun API. A bug has also been patched which sometimes caused emails sent out from thatwebsiteguy.net with “\”That Website Guy\”” as the name. A bug that was recently introduced which caused new users to have styling issues in the admin panel has been fixed. An issue was discovered where adding a new user to your website via the admin panel sends out an email with an invalid login link. This issue has now been fixed. Sites that have page builder templates as their site header or footer have had a minor bug fixed related to an issue that popped up on the new debug tool. A CORS issue was discovered on sites that use custom fonts combined with a CDN and is now fixed. A long-standing bug which prevented access to site robots.txt files has finally been patched. Another long-standing bug which sometimes caused a specific page built with the page builder to appear across the whole site has finally been patched. Once those issues were patched, work begun on refining the platform and the user experience. The “My Account” dashboard on thatwebsiteguy.net now has ajax-ified tabs, and the “Extras” tab has been moved to its own page and is now only accessible to logged-in users. The affiliate dashboard login link for logged out users has been fixed to go to the “My Account” page. The McAfee Secure trustmark on thatwebsiteguy.net will now also show up for logged in users giving them the opportunity to leave a review, and to help build trust when managing site subscriptions or buying extras. Various styling tweaks and fixes throughout thatwebsiteguy.net & the knowledge base. Various scripts used on thatwebsiteguy.net have been moved from the head to the footer to help with page load times, and JS/CSS files are now minified & concatenated which has more than halved page load-times in my tests. The front-end product detail pages “Additional Information” tab on all sites has been updated to list attributes in a new-line list format instead of a comma separated list. The footer branding which is optionally displayed on your site’s front-end has had it’s center tags replaced with styling due to the center HTML tag being deprecated. The platform’s database has been cleaned and optimised, as well as expired site cache and media. And finally platform underwent a sleight performance enhancement update related to unnecessary SSL checks on each site. The support dashboard on thatwebsiteguy.net has finally been transformed and totally revamped, and a bug has been fixed which prevented the admin-panel support menu from appearing for some users. The “Help” dropdown panel in the admin panel has had its content and styling tweaked too. Now if you ever need help with anything or have an issue, it’s preferable to use the support ticket system as it will make keeping track of support requests much easier as opposed to Twitter DMs (which are all too easy to get lost/buried), regular email (similar issue amongst a sea of viagra pill promotions and Nigerian princes), or Facebook Messenger which doesn’t even notify me of new messages 90% of the time. You may have also noticed a new Live Chat feature on thatwebsiteguy.net and in your admin panels. This new feature is being trialled and may be kept as a permanent support feature. Admin panel menus have been updated and refreshed, bringing with them new sub-menu items for “Saved Rows” & “Saved Modules” under the Appearance menu related to the page builder. “Templates” has also been renamed to “Saved Templates” for continuity. The Media Library browser uploader tool page text has been reworded for clarity. The Store Settings page tabs have been re-styled, and the current tab will now be highlighted. The standard ecommerce “Shop” page’s edit screen now displays a message explaining that page’s purpose. The Website Settings page tabs have been re-written to be much more future-proof and user friendly. Now the admin menu “Website Settings” item will remain highlighted for all website settings tabs. Extra styling has also been added for better display on mobile screens. The Admin panel menu logo has been re-written to be much more future-proof. The Admin panel page titles viewable in browser tabs have been re-written to be much more future-proof. The Admin panel styling has also been tweaked and optimised for better deliverability. The Wishlists app settings page has been reworded for clarity, and “Wishlists” no longer appear in the dashboard’s “At a Glance” metabox. The Social Sharing app has been updated for better compatibility with the Product Tab Manager & Wishlists apps. A bug was also fixed where duplicate social sharing icons would appear in the footer area of some sites. The Solve Media Integration app settings page has been re-styled, and a bug was fixed where the settings page could not be saved due to a permission error. The Viglink Integration app settings page has been reworded for clarity. The Facebook Messenger Integration app no longer has a default “Fan Page URL” set. The settings page menu item in the admin panel has also been renamed to “FB Messenger”. The McAfee Secure Integration app will no longer list an extra sitemap in the robots.txt file (related to their pro plan, and unnecessary as we use our own sitemaps), and a minor bug has also been discovered & fixed. The Comment Reply Email Notification app has had a minor bug fixed. The Google Analytics Integration app has had a minor bug fixed related to admin notices, and all sites using our legacy Google Analytics Integration app have been switched over to the new & improved app. Finally, the signup process was taken for a test run-through. Many notes were made of things that need fixing, things that need tweaking, and things that could be better, and many of the changes have already been implemented. First off, the site activation page content has been updated for more clarity on how to get started, and the site login page link has been removed (since the admin dashboard link will take you to the login page anyway if not logged in). The welcome email received upon new site signup has been reworded and login links have been fixed. The admin dashboard welcome panel’s “List a product” / “List another product” text has been fixed to work better with the new demo products that get added to new sites. New sites will no longer have an inactive sidebar listed on their “Appearance > Widgets” page containing several unused widgets. New sites will no longer have any default “forced https” URLs on the Domain Mapping settings page. New sites will also no longer have a dummy “From” name & email pre-filled on the store settings email tab. The site subscription processes have been updated yet again for stability and maintenance, hopefully fixing the last few major bugs left on the platform. If these last few major bugs still remain then some radical changes will be dropping next month to the site subscription process.